The Apple Watch failed to be the popular stocking stuffer that Apple had hoped for. During the last three months of 2015, Apple shipped about 4.1 million of its smartwatches, according to a new report from IDC (Apple doesn't publicly disclose its Watch sales). Most investors and analysts had predicted that Apple would sell at least 5 million -- more than the estimated 3.9 million that it shipped in the previous quarter. The holiday season usually gives Apple (AAPL) a good boost in sales. "We're convinced that the Watch will be one of the top gifts of the holiday," CEO Tim Cook told analysts back in July. But Apple shipped just 200,000 more Watches in the last three months of the year than it did during the summer. "It's a fairly obvious assumption that the holidays [would help]," IDC analyst Jitesh Ubrani told CNNMoney. "Around the world though, there's been muted demand for the Apple Watch...people don't see the value just yet." The Apple Watch comes in three models. The cheapest -- the Apple Watch Sport -- costs $349. 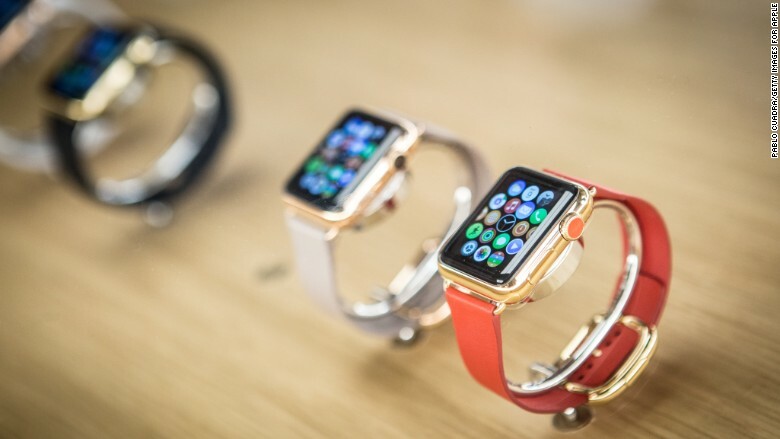 Demand for the devices failed to keep up even as U.S. retailers like Best Buy (BBY) and Target (TGT) offered sales and promotions for the watches during the holidays. "They were trying to get rid of inventory at that point," said Ubrani. Apple had no comment on the IDC report. In January, CEO Tim Cook told investors only that the company "set a new quarterly record for Apple Watch sales, with especially strong sales in the month of December. The Apple Watch is the company's first new consumer product line under Tim Cook. The watches first went on sale in April of last year. Since then, Apple has managed to become the third top vendor of wearables in terms of global shipments. With 14.9% of the market share, Apple is behind Xiaomi, which has 15.4% share, and Fitbit (FIT), which has 26.9%. That's pretty impressive given that Apple doesn't make nearly as many different kinds of wearables as the other two companies. Apple may have a better chance of selling and shipping its smartwatches in 2016 due to a growing general interest in wearable devices, as well as hardware and software updates that will make the phone more useful to customers. From 2014 to 2015, the total shipment of wearables grew 171.6%, according to IDC. And if Apple were to add cellular connectivity to its smartwatches, the devices would no longer need to be tied to an iPhone to fully work. More importantly, wireless carriers would have an incentive to help sell the devices too.